After much hard work Visual.ONS has now launched! The website shows ONS statistics using a wide range of content: infographics, interactive visualisations and short studies. The purpose of the site is to “make data, statistics and analysis more accessible, engaging and easier to understand”. The motto of the website “official data, new light” sums up the ONS’s desire to display their statistics in a new way. The balance of visual and informative aspects together make the site much more interesting and engaging than more traditional approaches to publishing statistics. All the articles are related to current affairs which people might want to find out more about and they are grouped into categories for those who are interested in certain subjects. The site is responsive and scales nicely from large desktop to mobile phone screens. We made sure that all the important information is visible and accessible to the users no matter what device they are using. It also allows users to browse between related data and share it via email or social media sites, like Facebook, Twitter and Google+. To help the team at ONS keep the site up to date, we made a range of shortcodes that make it easy to embed a wide variety of content. Visualisations, important data, explanations and footnotes contribute to the clear and diverse presentation of information, making it much easier to understand. 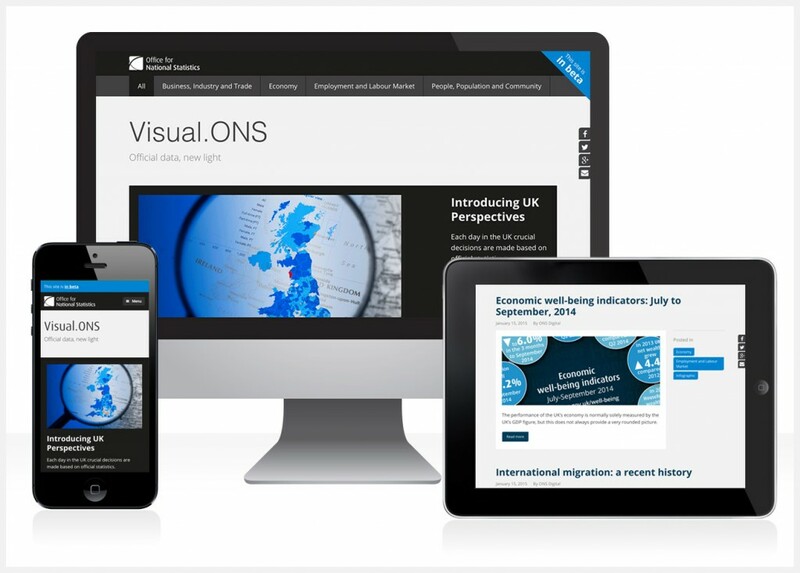 You can read more about the aims of the site on ONS Digital Publishing.